Sundance Review: Where’s My Roy Cohn? By Kip Mooney • On January 29, 2019 January 29, 2019 • In Featured, Sundance	Featured, Sundance Comments Off on Sundance Review: Where’s My Roy Cohn? There's a strong case to be made, especially after watching this documentary, that Roy Cohn is the single most influential and awful American of the 20th Century. A deeply complicated but thoroughly repugnant man, Cohn's fingerprints can be found on some of the lowest points in U.S. politics, including our current one. A power-hungry lawyer from New York, he was interested only in furthering his own interests, making a quick buck off everyone he could. His only friends were the people he could help do the same. But if you're not familiar with him, you're not alone. (I only knew him as a character in Tony Kushner's Angels in America.) This documentary makes sure you'll know all the awful details. A hot-shot attorney from the Bronx, he was appointed prosecutor in the notorious trial of Julius and Ethel Rosenberg. The husband and wife were accused of espionage. They were likely guilty (or at least Julius was), but Cohn had no qualms about using a ton of unethical tactics to ensure their conviction and execution. 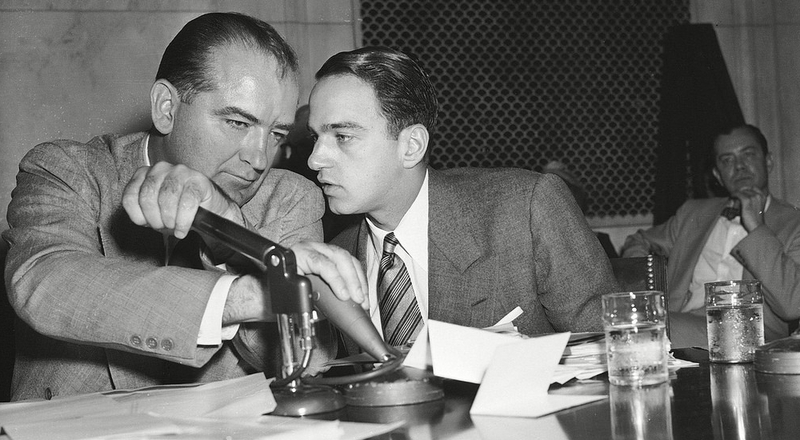 He used his rising star to land a job as Senator Joe McCarthy's chief counsel, launching the House Un-American Activities Committee, hauling in hundreds of Americans to ask them about their possible Communist history. But the tide turned against them when they began accusing military brass of hiding Communists, partially in retaliation for refusing to give Cohn's friend (and possible lover) G. David Schine a deferment. Cohn had a lot of contradictions: He was a registered Democrat who almost exclusively helped the campaigns of Republicans. He was Jewish but sought to minimize his heritage. But his biggest secret was that he was gay and in the closet. Numerous people in the film point out that his large platform could have saved the lives of many gay men, had he come out and shared his AIDS diagnosis. Instead, he took it with him to the grave, even having Ronald Reagan arrange for him to receive special treatment for his disease that wasn't yet available to the general public. In the end, Cohn died without friends and without much money. He burned through people, cash and sexual partners, not caring who he hurt in the process. Where's My Roy Cohn? is an important, informative documentary, and perfect example of how not to live your life.